J-Prime Steakhouse is a new restaurant in north central San Antonio. Winner of Best New Restaurant by SA Monthly Magazine and Best New Restaurant from San Antonio Magazine, J-Prime is making quite the splash here in the Alamo city. However, starting an award winning restaurant requires more than delicious food; it requires a complete experience. Top tier restaurants require professional waiters and waitresses, a clean atmosphere, skilled bartenders, consistent and detail oriented presentation, and consistent, quality branding. A business’ branding quality and consistency helps shape the customer’s experience and ensure memorability. To that end, Vuepoint Creative crafted a comprehensive set of print material for J-Prime Steakhouse. Every restaurant needs a good menu that helps set the tone of the restaurant. We designed a main menu, wine list, dessert menu, and bar menu for J-Prime. 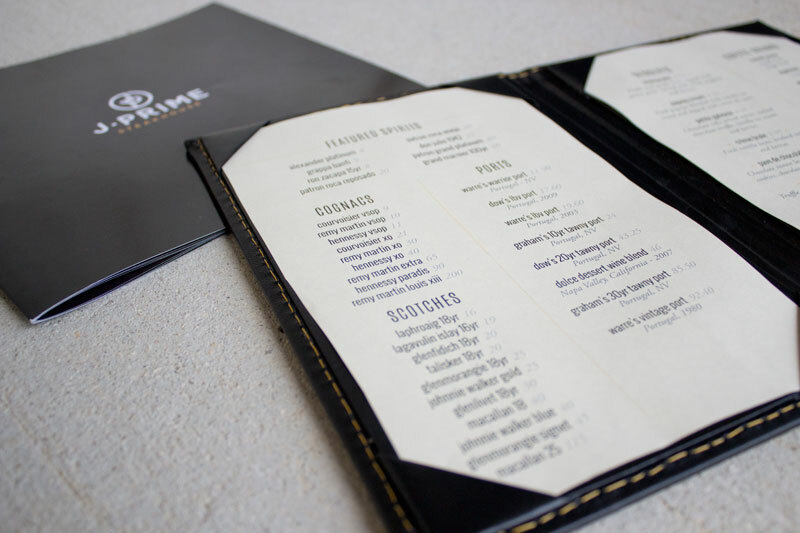 The menu was crafted to emulate J-Prime’s high class atmosphere in an easy to skim manner, ensuring patrons can easily find and select the menu item they are looking for. Founding a successful restaurant requires more than firing up the grill and opening the doors. Business owners must be proactive in seeking out customers and business relationships. To help J-Prime Steakhouse grow their business, Vuepoint Creative designed a brochure to showcase everything that makes J-Prime unique and one of the best steakhouses in San Antonio. J-Prime will use this brochure to reach out to and build relationships with various businesses in San Antonio, such as hotels or country clubs. Another one of J Prime’s efforts to bring in new customers is through gift certificates. We created a gift certificate that can be easily adapted for multiple events, while remaining consistent with J Prime’s branding. The simple typographic focus paired with spot gloss and hand written details provides a sophisticated and personal touch. Gift cards have been shown to increase revenue, and J-Prime takes full advantage of this business asset. We designed their gift cards, as well as gift card sleeves, and even added eCommerce functionality to their website to purchase gift cards. Most restaurants have business cards, and J-Prime Steakhouse is no exception. We provided J-Prime with two different designs. The first is a standard card for the owner to hand out personally. The other is an uncommonly sized card available to all patrons at the hostess stand. As a high end restaurant, J-Prime Steakhouse needs every detail to be perfect. From the food’s flavor all the way to their print material. Vuepoint Creative provided comprehensive and detail oriented print design, helping J-Prime become “Best New Restaurant” in San Antonio.